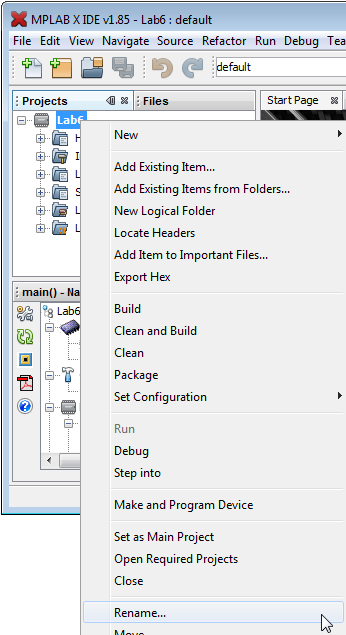 In the project window, right click on the top node of a project in the tree and select Rename from the popup menu. Enter a new name for the project. 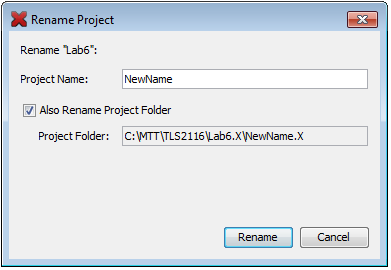 You must also choose to rename the project folder since a project folder's name IS the project name. Do not attempt to rename a project by changing the project directory name in your file manager (e.g. Windows Explorer). This will not affect that project's name which is buried in the xml files that comprise the project's settings. Although the directory will have a new name, the project will still show the old name when reopened in MPLAB X IDE.